Sign up for North to My Future, your FREE individualized college admissions strategy session. "I appreciate the free consultation, with no obligation to purchase. The information we received in the North to my Future consultation was immensely helpful and shaped decisions we made to visit colleges." 1. Where Do I Stand? We'll compare your profile (including the scores from your practice SAT/ACT) with the admissions norms for your colleges of interest. 2. Am I On Track? 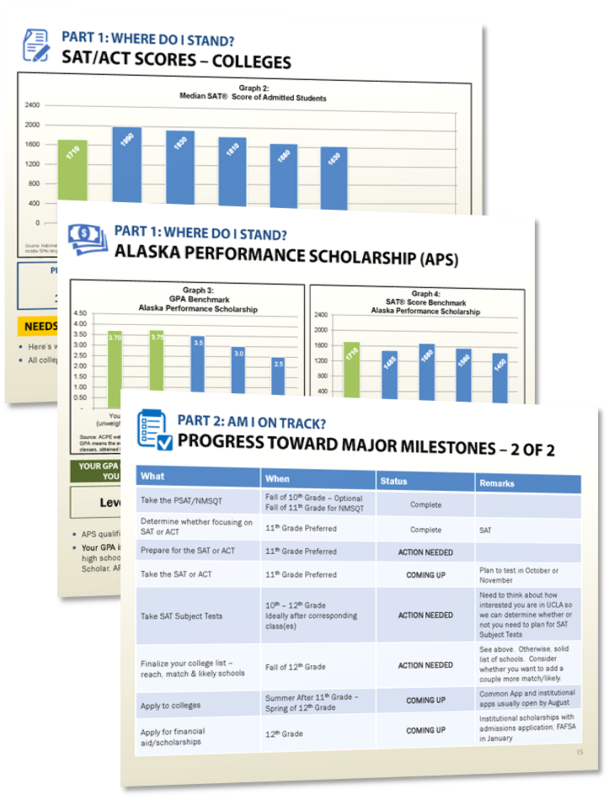 We'll show you whether you've completed the key college planning tasks for your grade level and goals. 3. My Action Plan. We'll outline your timeline of priorities from now through high school graduation. Take a look at a de-identified sample of another student’s North to My Future packet so you can see what kind of discussion and insight you'll benefit from during your meeting.